Jerry Tarkanian put the University of Nevada, Las Vegas on the map. The Runnin’ Rebels former coach, who died yesterday at age 84, was the architect of a basketball powerhouse that established UNLV as a national brand. Tarkanian and UNLV, followed the example of other major universities and used sports as an important method of public relations to transform their institution. Indeed, college sports teams have long been used for publicity by major universities. Throughout its history, college football has proved to be an effective public relations tool. One of the first actions of University of Chicago President William Rainey Harper was to hire Amos Alonzo Stagg as the school’s football coach. Harper hoped to build a championship team that would attract publicity for the new college. Other major universities followed suit. My dissertation identifies a critical moment when the University of Oklahoma decided to use football and returning WWII veterans to counter popular narratives that negatively portrayed the state of Oklahoma. They hired Jim Tatum and Bud Wilkinson to build a championship football program. The plan was no secret to these coaches. Tatum spent lavishing in his lone year at Oklahoma, recruiting players and offering them incentives to settle in Norman. Though Wilkinson followed less expensive and cleaner recruiting methods, he justified the cost of recruiting trips as “university promotion” on his travel application forms. He was well-informed that football was an integral part of building up the university and the state of Oklahoma. The use of basketball to build a university, on the other hand, has been less common. This is largely because college basketball developed more slowly than football. The public spectacle around the game never quite equaled college football. It wasn’t until the NCAA tournament exploded into a major television event in the 1980s that the sport took off and TV money followed. To be sure, college basketball was important before then, but it did not have the same transformative ability. As John Matthew Smith has argued, John Wooden’s dynasty at the University of California, Los Angeles played a crucial role in the modernization of college basketball. Wooden helped not only usher college basketball into a new era, but also UCLA. Founded as a two-year school in 1919, it was more or less an extension campus of the University of California in Berkeley. Returning veterans and the GI Bill contributed to a near tripling of the school’s size between the end of the Second World War and 1950. Wooden took over before the 1948-49 season amidst this rapid growth. Though UCLA won a football national championship in 1954, by the 1960s the school had become synonymous with basketball success. Beginning in 1964, Wooden’s UCLA teams won 10 NCAA basketball championships over the next 12 years. While it’s probably unlikely that UCLA administrators sought out basketball to help build the university, it is not unreasonable to suggest that UCLA’s educational ascent benefited from its basketball prowess. Watching these developments closely, however, were administrators at a fledgling new college in southern Nevada. Like Los Angeles and UCLA, Las Vegas was rapidly growing in the postwar era. To satisfy demands for higher education, the University of Nevada began offering college classes in the evenings at Las Vegas High school. Soon the course offerings expanded and the first building at Nevada Southern University, as it was then called, opened in 1957. The political and economic power began shifting from north to south in Nevada during the 1960s. As the state’s two population centers, Reno and Las Vegas, struggled for control and influence, Nevada Southern University and its athletic programs became symbols in the fight. Las Vegas needed more than just its own college. It needed a rallying point for the community and a brand it could sell alongside the glitzy neon lights of the strip to attract students and donors. By 1968, the south had won, and Nevada Southern University was granted equal status with its parent university. A year later, the school was renamed the University of Nevada, Las Vegas. UNLV began playing basketball in the 1960s and adopted the Rebels nickname along with confederate colors to highlight their separation from the University of Nevada. After being rebranded as a peer, the school joined NCAA Division 1 in 1970. According to Richard O. Davies, despite the new name the school was “often derisively referred to by locals as Tumbleweed Tech.” It was the derisive nickname, Davies explains, that prompted UNLV leaders to seek out a new basketball coach that could build a nationally recognizable program. Baepler earned his doctorate at Oklahoma, and had seen first hand what the university had to do. The image-conscious university considered multiple options. Simply funneling money into academic excellence did little to broadcast the university or its quality. While UNLV’s leaders were familiar with the strategies employed by the University of Chicago and the University of Oklahoma, they worried that building a top-tier football team would be too expensive, too risky, and take too long. Basketball was a quicker option, and it required fewer star players to compete at a high level. Step one in getting the Rebels running was hiring the right coach. He needed a demonstrated track record of success, a bombastic personality to fit the Las Vegas culture, and most importantly, an insatiable will to win. Jerry Tarkanian met these requirements, and was named head coach at UNLV in 1973. “Tark the Shark” as he became known, perfectly fit the temperament of Southern Nevada. Like the wise guys and mob bosses who funded his program, he exhibited a trademark swagger and rebelliousness hardened by years of success. Just as they disdained snitches and federal investigators, Tarkanian deeply detested the NCAA. Under Tarkanian, UNLV quickly became an elite basketball program. They made the NCAA tournament in Tarkanian’s second year. Two years later, the Runnin’ Rebels made their first Final Four. In total, Tark’s teams played in four Final Fours. They won the 1990 NCAA Championship and nearly repeated the following year. UNLV’s brand and name recognition soared, quickly surpassing its northern rival, who politicians forced to add comma Reno to its name. Now, few outside the state knew that the University of Nevada, Reno was the state’s oldest and only land-grant institution. Sports as boosterism seemed to work. But, what happens in Vegas does not always stay in Vegas. Tarkanian’s bravado and outspoken criticism of the NCAA got him into trouble. Unlike Stagg, Wooden, and Wilkinson, he wasn’t respected for running a clean program. Instead, the NCAA was deeply suspicious of Tarkanian and went to great lengths to investigate his every move. Following their 1977 Final Four run, the NCAA tried to force UNLV to suspend Tarkanian for two-years without pay. This was an unacceptable penalty to Tarkanian, especially because it came from an organization that denied him due process and the right to confront his accusers. Rather than accept the sanctions, he fought back in the courts. The investigations into the UNLV program were not entirely unwarranted. Tarkanian had a reputation for taking care of his athletes, even after their playing careers were over. He also went after recruits that other coaches overlooked, including junior college and inner-city players. Many of these athletes came with baggage that varied from poor academic performance to criminal records. Careless with the NCAA rules, Tarkanian fed them and sometimes let them stay at his home. He crafted an image as a defender of marginalized poor and outcasts athletes, hung out to dry by the NCAA rulebook. Tarkanian’s legal fight with the NCAA lasted nearly two decades. Though he eventually lost his case in 1988, after it reached the Supreme Court, he never served his two-year suspension. Instead, his UNLV teams continued winning in spite of the NCAA’s watchful eye. Despite the continued success, Tarkanian’s rebelliousness began to wear on many of his supporters at UNLV. University President Robert Maxson worried that the coach’s legal battles and outlaw image were beginning to hurt the university. Though Tarkanian built the UNLV brand, he now threatened it and the school’s continued efforts to establish itself as respected academic institution. Maxson wanted the university to be known for more than just its basketball program and renegade coach. 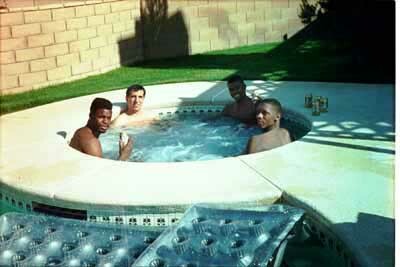 The beginning of the end came less than two months after the 1991 Final Four when the Las Vegas Review-Journal published pictures of UNLV players in a hot tub accompanied by prominent sports gambler and ex-con, Richard “The Fixer” Perry. The photos disturbed Maxson and NCAA officials who feared the influence of gamblers on athletes, especially one who had been convicted of bribery. Tarkanian claimed to have warned his players to stay away from Perry, but Maxson forced him to resign following the 1991-92 season. The local backlash against Maxson was intense, however, and he was soon forced to resign himself. Athletics had become so ingrained in UNLV’s image that academic improvements couldn’t save him. Despite Tarkanian’s resignation, the NCAA kept hounding him. Now the coach at his alma mater, Fresno State, the NCAA continued to claim that gamblers swayed the results of his team’s games. The accusations were unproven, and Tarkanian launched a second legal assault against the NCAA. He was successful in this case, receiving a $2.5 million settlement in 1998 and an admission of guilt by the NCAA. For Tarkanian, it confirmed what he long believed: he had been unfairly targeted throughout his career. 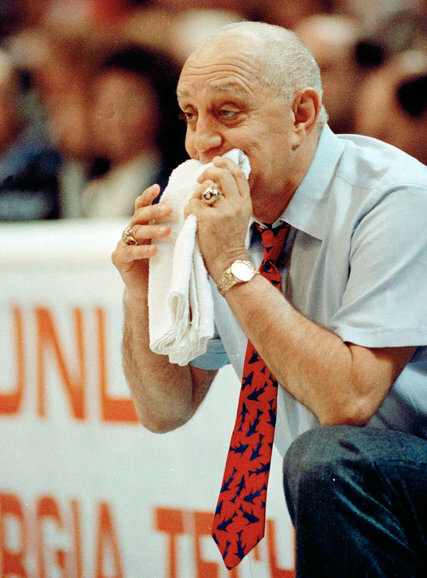 Jerry Tarkanian’s successful coaching career is symbolic of the promise and perils of sports boosterism. It is also highlights the heavy-handedness of the NCAA and its favoritism towards established powers. Tarkanian outlined his view of the NCAA’s selective enforcement policy in a 1973 Long Beach newspaper column. “It’s a crime that Western Kentucky is placed on probation,” he said. “The University of Kentucky basketball program breaks more rules in a day than Western Kentucky does in a year. The NCAA just doesn’t want to take on the big boys.” In the end, Tarkanian became one of the big boys. And, despite the NCAA’s best efforts, he won. Rest In Peace Jerry Tarkanian. ← #putoutyourbats: Social Media and the Death of Australian Cricketer Phillip Hughes. It’s not a good time to be a former college basketball coach in your 80s. Dean Smith died on Sunday. Jerry Tarkanian died yesterday. Here are some thought on Tarkanian’s career fighting the NCAA and the role he played in building up UNLV. I really enjoyed this article. I love to learn more about the history of college basketball and the great coaches like John Wooden and Jerry Tarkanian. It does not surprise me though that the NCAA continuously attacked Jerry Tarkanian because of the repeated success his teams had and what had appeared as breaking of the rules but was just, for the most part, Jerry being a good guy looking out for the under privileged athletes. I also think it is pretty cool to think UNLV started as a small two year school, and it grew to the division 1 basketball power house it is. I have a question as well. Has the NCAA ever busted a division 1 basketball team for a rule violation?